این مقاله با بکارگیری داده‌های ترکیبی به بررسی رابطه بین نرخ ارز حقیقی و اشتغال در زیربخش‌های صنعت (بر اساس کدهایISIC دو رقمی) برای اقتصاد ایران در طول دوره 1380-1386 می‌پردازد. برای دستیابی به این هدف کانال‌های حجم صادرات ،‌ بکارگیری نیروی کار در تولید و کانال کارایی مورد توجه قرار گرفته و تأثیر تغییر نرخ ارز بر اشتغال از طریق هر یک از این کانال‌ها به صورت جداگانه ارزیابی شده است. نتایج این تحقیق نشان داده که افزایش نرخ ارز حقیقی بر اساس دو کانال حجم صادرات و کانال بکارگیری نیروی کار در تولید به افزایش اشتغال در این بخش منتهی شده است. همچنین نتایج حاصل از برآورد مربوط به کانال کارایی نشان داده که افزایش درجه باز بودن اقتصاد در زیربخش‌های صنعت بر اشتغال این بخش تأثیری نداشته است. اما افزایش مستقیم نرخ ارز حقیقی باعث افزایش اشتغال شده است. با مقایسه نتایج حاصل از برآورد کانال‌های مختلف اثرگذاری به نظر می‌رسد که افزایش نرخ ارز حقیقی به افزایش اشتغال در بخش صنعت برای اقتصاد ایران در طول دوره مورد مطالعه منتهی شده است. By using panel, this paper investigates the relationship between real exchange rate and manufacturing employment (according to two- digits codes) in Iran economy over the period 2001-2007. An approach to this goal, export volume channel, the labor intensity and efficiency channels are notified. The results of this paper show that increase in real exchange rate induce to increase employment based on export volume and labor intensity channels. Furthermore, the estimation results of efficiency channel show that increase in openness of subsector of industry doesn't affect on manufacturing employment. But direct increase in real exchange rate causes to increase employment in manufacturing industry. By comparing, the estimation results of different channels seem that the increase of real exchange rate has ended to increase manufacturing employment in Iran economy during the period. 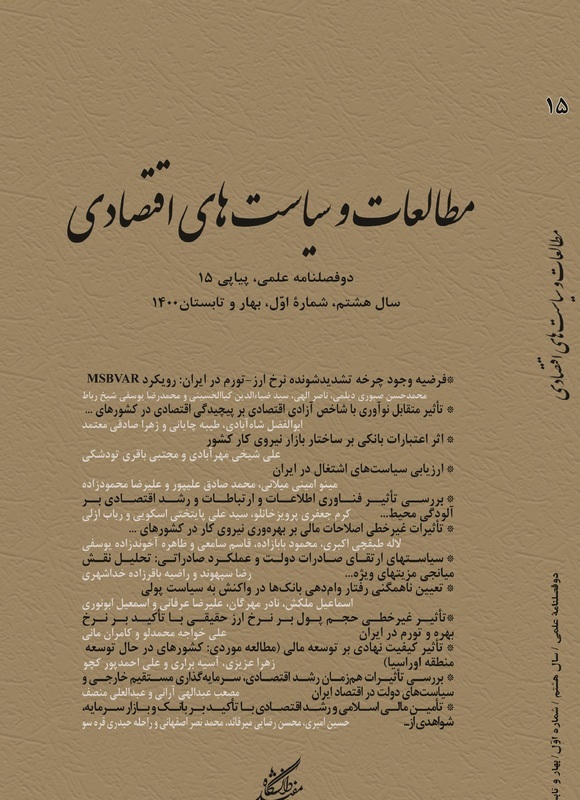 باقرکلانتری،‌ عباس؛ عرب مازار، عباس؛ «برآورد تولید بالقوه کشور در سال‌های 1338-1371»، مجله اقتصادی دانشگاه شهید بهشتی، 1374، شماره 4. توکلی، اکبر؛ آذربایجانی، کریم و شهریارپور، علی؛ «اندازه­گیریوتجزیهتحلیلبهره­وریعواملتولیددرگروه­هایصنایعایران، 1351-1373»، سازمان برنامه و بودجه، 1379، شماره‌های ۵۲ و ۵۳. ختایی، محمود؛ دانش جعفری، داوود؛ «بررسی تأثیر تکان‌های تولید، سطح قیمت‌ها، ارز، پول در نوسان‌های اقتصاد کلان ایران، رهیافت خودرگرسیون برداری»، مجموعه مقالات یازدهمین کنفرانس سالانه سیاست‌های پولی و ارزی، تهران، مؤسسه تحقیقات پولی و بانکی (پژوهشکده) بانک مرکزی جمهوری اسلامی ایران، 1380. زراء نژاد، منصور؛ انصاری، الهه؛ اندازه­گیریبهره‌وریسرمایه درصنایعبزرگ استانخوزستان، فصلنامه بررسی­های اقتصادی، 1386، ص1-26. زراء ن‍ژاد،‌ منصور؛ قنادی، بهروز؛ «تخمین تابع بهره‌وری نیروی کار در بخش صنایع استان خوزستان»، فصلنامه پژوهش­های اقتصادی ایران، 1384، شماره 24، ص 33-52. محمدی، تیمور؛ غلامی، امیر؛ بررسی تأثیر یکسان‌سازی نرخ ارز بر متغیرهای اساسی کلان اقتصادی، پژوهش­نامه اقتصادی، 1387، شماره 8 «2 پیاپی (29)»، ص 49-74. مولایی محمد؛ قره‌باغیان، مرتضی؛ صباغ کرمانی، مجید؛ «بررسی و مقایسه بهره­وری گروه‌های مختلف صنعتی کوچک و بزرگ ایران»، مدرس، 1381‌، شماره 3، ص 147-169. Alexandre, F; Bação, P; Cerejeira, J. and Portela, M; 2010, Employment, exchange rates and labour market rigidity, IZA Discussion Paper, No. 4891. Appleyard, D. R. and Alfred, J. F; 1995, International economy: Trade Theory and Policy, Library of Congress, USA. Bahmani-Oskooee, M; Mirzaie, I. A. and Miteza, I; 2007, Sectoral employment, wages and the exchange rate evidence from the US, Eastern Economic Journal, Vol. 33, No. 1, pp. 125-136. Balassa, B; 1978, Exports and economic growth: Further evidence, Journal of Development Economics, Vol. 5, pp. 181-189. Baltagi, B; 2005, Econometric analysis of panel data, Torento, John Wiley & Sons, Inc.
Branson, W. H. and Love, J. P; 1987, The real exchange rate and employment in US manufacturing: State and regional results, NBER Working Paper Series, No. 2435. Campa, J. M. and Goldberg, L. S; 2001, Employment versus wage adjustment and the US dollar, The Review of Economics and Statistics, Vol. 83, No. 3, pp. 477-489. Faria, R. and Leon–Ledesma, M. A; 2005, Real exchange rate and employment performance in an open economy, Research in Economics,Vol. 59, pp. 67-80. Filiztekin, A; 2004, Exchange rates and employment in Turkish manufacturing, Sabanci University Discussion Paper Series, No. 0405. 129.3.20.41/eps/if/papers/0501/0501004.pdf. Frenkel, R. and Ros, J; 2005, Unemployment and real exchange rate in Latin America, World Development, 2005, Vol. 34, No. 4, pp.631-646. Frenkel, R; 2004, eal exchange rate and employment in Argentina, Brazil, Chile and Mexico. http://www.g24.org/fren0904.pdf. Fu X. L. and Balasubramanyam, V. N; 2005, Exports, foreign direct investment and employment: The case of China, The World Economy, Vol. 28, NO. 4, pp. 607-625. Galindo, A; Izquierdo, A. and Montero, J. M; 2007, Real exchange rates, dollarization and industrial employment in Latin America, Emerging Markets Review, Vol. 8, pp. 284–298. Goldberg, L. and Tracy. J; 1999, The Mechanisms for exchange rate and wage interaction. http://www.nber.org/~confer/99/itisi99/goldberg.pdf. Greenaway, D. R ; Hine, R. and Wright, P; 1999, An empirical assessment of the impact of trade on employment in the United Kingdom, European Journal of Political Economy, Vol. 15, pp. 485-500. Hsiao, C; 2003, Analysis of Panel data, Cambridge University Press, Cambridge. Hue, P; 2007, Real exchange rate and manufacturing employment in China, China Economic Review,Vol. 18, pp. 335-353. Kandil, M. and Mirzaie, I; 2003, The effects of dollar appreciation on sectoral labor market adjustments: Theory and evidence, The Quarterly Review of Economics and Finance, Vol. 43, pp. 89–117. Klein, M; Scott, S. and Triest, R; 2003, Job creation, job destruction, and real exchange rate, Journal of International Economics, No. 59, pp. 239-265. Koren, M; 2001, Employment response to real exchange rate movements: Evidence from Hungarian exporting firms, Hungarian Statistical Review, Vol. 79 (S6), pp. 24-44. Kruger, A; 1980, Trade policy as an input to development, American Economic Review, Vol. 70, pp. 288-292. Lee, E. and Jansen, M; 2007,Trade and employment, A joint study of the International Labour Office and the Secretariat of the World Trade Organization. Leichenko, R. and Silva, J; 2004, International trade, employment and earnings: Evidence from US rural countries, Regional Studies, Vol. 38, No. 4, pp.355-374. Milner, C. and Wright, P; 1998, Modeling labour market adjustment to trade liberalization in an industrializing economy, Economic Journal, Vol. 108, pp. 509−528.